A man who had been paralyzed for five years following a spinal cord injury has demonstrated the ability to walk using his own brain power, according new research from the University of California, Irvine. The authors of the preliminary study, published in the Journal of NeuroEngineering and Rehabilitation, say that the results prove it is possible to use direct brain control to overcome paraplegia and get a person walking again. This is the first time that a person with complete paralysis in both legs resulting from a spinal cord injury was able to walk without employing the use of manually controlled robotic limbs. Using an electroencephalogram (EEG) based system that takes electrical signals from the participant's brain and sends them down to electrodes placed around his knees, the patient walked along a 12-foot course. "Even after years of paralysis the brain can still generate robust brain waves that can be harnessed to enable basic walking," lead researcher Dr. An Do explained in a statement. 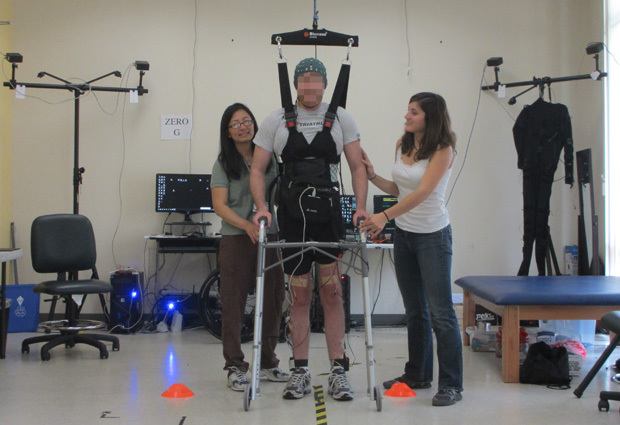 "We showed that you can restore intuitive, brain-controlled walking after a complete spinal cord injury. This noninvasive system for leg muscle stimulation is a promising method and is an advance of our current brain-controlled systems that use virtual reality or a robotic exoskeleton." Getting the patient to walk was a rigorous process that took place over the course of 19 weeks, the study authors report. He first underwent mental training to reactivate the brain areas responsible for controlling movements involved in walking. The researchers placed an EEG cap on his head to read his brainwaves, and he trained to control an avatar in a virtual reality setting. The participant also required physical training to strengthen his muscles. He later mimicked walking while suspended 5 cm above the ground so he could practice freely moving his legs without having to support himself. He gradually regained strength and control, and on the 20th visit, he was able to walk on the ground while wearing a body-weight support system for aid and to prevent falls. The authors note that as the study involved only one patient, further research is needed to see whether the results would translate to a larger population of people with paraplegia. "Once we've confirmed the usability of this noninvasive system, we can look into invasive means, such as brain implants. We hope that an implant could achieve an even greater level of prosthesis control because brain waves are recorded with higher quality," lead study author Dr. Zoran Nenadic said. "In addition, such an implant could deliver sensation back to the brain, enabling the user to feel their legs."